The shadows are too much. They seem to really weight the image down. I also wish it would've shown the whole dam. It looks so impressive. I'm not sure how much of it would fit in the frame either because of where you can and can't take pictures there. Perfect exposure. Crop works pretty well. 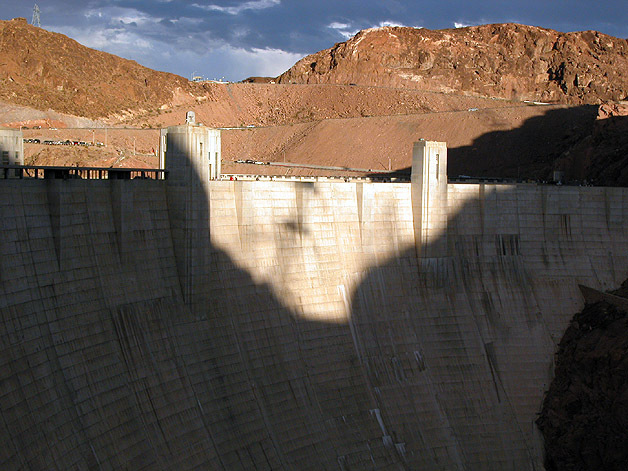 I wonder if maybe a portrait orientation would have had more impact, emphasize the height of the dam? Interesting choice, this shot is a good record of life in our times I think. I would like to see it without the dirt on the right tho. The shadow hurts this otherwise beautiful shot. I like your sky in the background and the way the dam really feels "big". The contrast the dark clouds provide against the mountains is very good. Too bad the dam itself isn't well lit, too. Overall great image! cool. I love how the light is between the two "towers". great use of light. cool pic. Proudly hosted by Sargasso Networks. Current Server Time: 04/18/2019 08:20:07 AM EDT.